Four Pounds Flour: Try This At Home: Make Yeast Appear--OUT OF THIN AIR! Try This At Home: Make Yeast Appear--OUT OF THIN AIR! This week has taken on a bit of a bread theme; I don't have much experience with bread, but I've always been fascinated by it. It seems magical, the way the dough puffs and doubles in size. The smell of yeast dough rising has always been appealing to me. But there was a question that had always bugged me. Before packets of commercial yeast, where did yeast come from? How did a woman living on the frontier in the 19th century make bread, the most basic and essential of items? The other day I got the unique opportunity to hang out behind-the-scenes at Orwarsher's Bakery, an upper east-side institution for the last 100 years. I had more fun with bread than I ever thought possible, and I also found time to ask them my burning question: where does yeast come from? The answer? From thin air. They told me: if you set out a bowl of water, flour, and sugar; yeast will come and live in it. That's called your starter. Over time, you scoop out what yeast you need, and add sugar, flour, and water back in to "feed" it. In this fashion, a yeast colony can be kept indefinitely. In Orwasher's case, their starter has been around since the bakery started over 100 years ago. So if you go into Orwasher's today, you are eating bread made from the great-great-great-(etc) grandchildrens of yeast that was floating around in the New York air in 1900. Kinda weird? A little, maybe. But also kinda awesome! Additionally, Orwashers is reviving a very old (see: medieval) technique of bread making which involves building a yeast culture from grapes being fermented for wine. 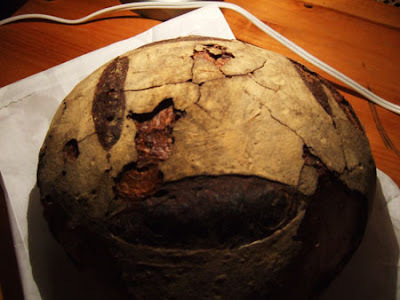 The resulting bread is dark and crusty, and looks like a loaf of bread out of a medieval banquet. They have several varieties available, and are great adorned with a smear of soft cheese or soaked in a bowl of hearty soup. I'm giving yeast growing a try at home. I referenced an 1845 recipe for yeast, and I've set out a bowel of flour, brown sugar, warm water, and a little salt . I'll keep you updated, and let you know what happens! P.S. : I hung out at Orwarsher's while doing a video for The Feedbag. See the video here. Dinner on the Road to Wellville: Wrap-up!